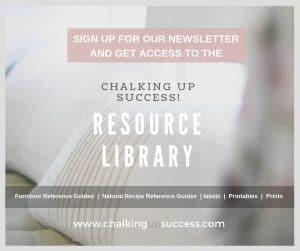 How to Stencil Furniture with Chalk Paint - Chalking Up Success! 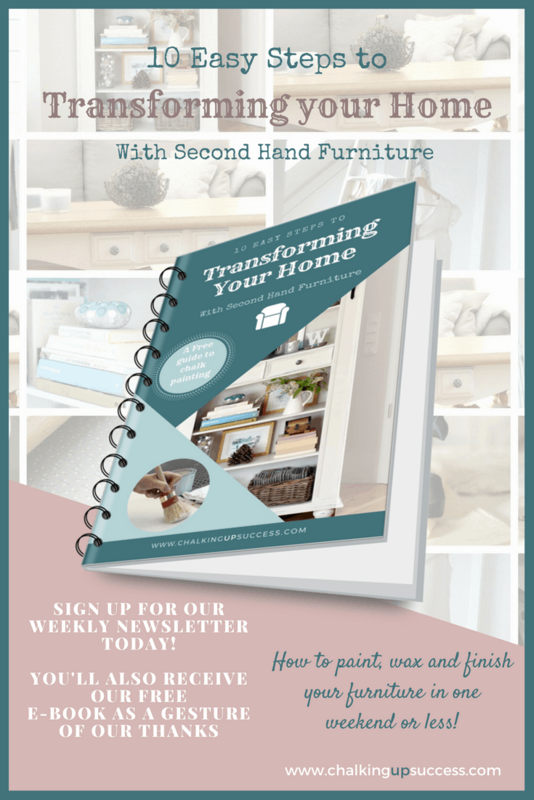 How to Stencil Furniture with chalk paint is part four and the last in the media stand makeover series. Today we’re going to cover applying the stencil, distressing and finishing the furniture with Annie Sloan clear wax and white wax. When we left the media stand in part three, it had been distressed with the sander showing the lovely Duck Egg Blue in patches all over the media stand. Although I love it at first, the more I looked at it, the more I could see that it didn’t really fit in with the rest of the furniture in the room. It was a little bit too distressed for the look I was going for. 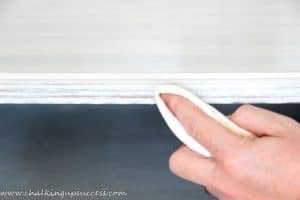 If you read or watched part three in this series, you may remember me saying that if distressing with the sander didn’t work out, I may have to make another chalk paint wash. Well, that’s exactly what I ended up doing. 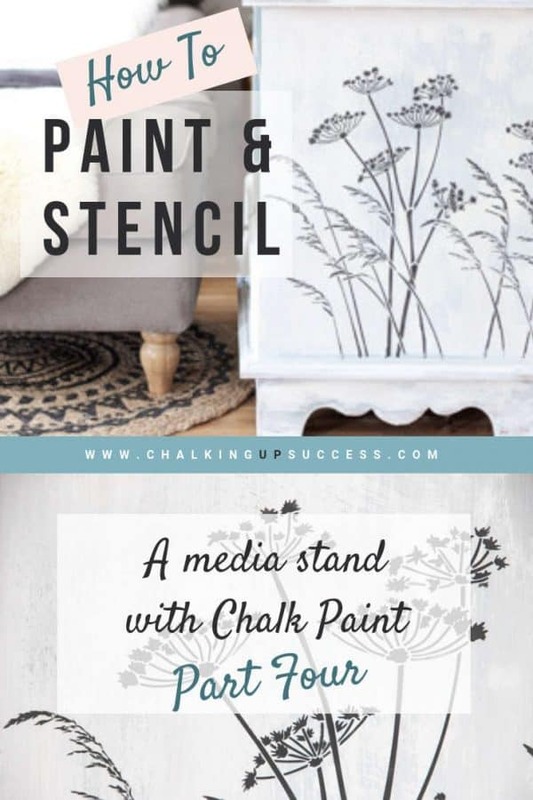 This time I made the chalk paint wash much thinner and kept layering it on all over the media stand until the chalk paint looked more blended. It may seem very subtle on the photos but believe me, it made a big difference to how the piece turned out. 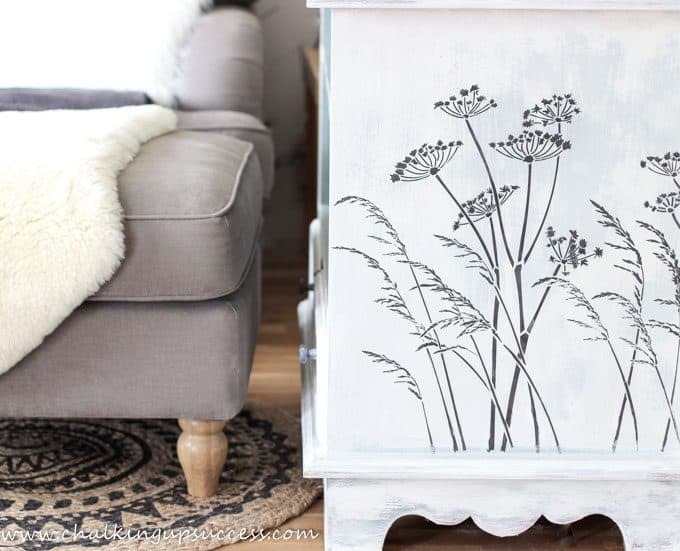 That’s the beauty of chalk painting furniture, you can always change things if you make a mistake or if the end result doesn’t turn out how you imagined. So I made another wash but this time it was much thinner and mostly water really. 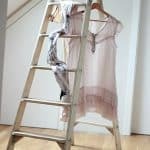 To be honest, this is how I should have made it the first time around and then I probably wouldn’t have ended up with chalk paint all over my lounge (See part three!). Anyway, I just kept adding the wash to the media stand until I was happy with the look. 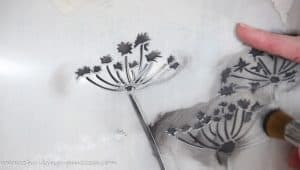 Anyone who knows me, knows that I love decorating my home with natural elements, things that I pick up on my walks with Brilli, like seed heads for instance. 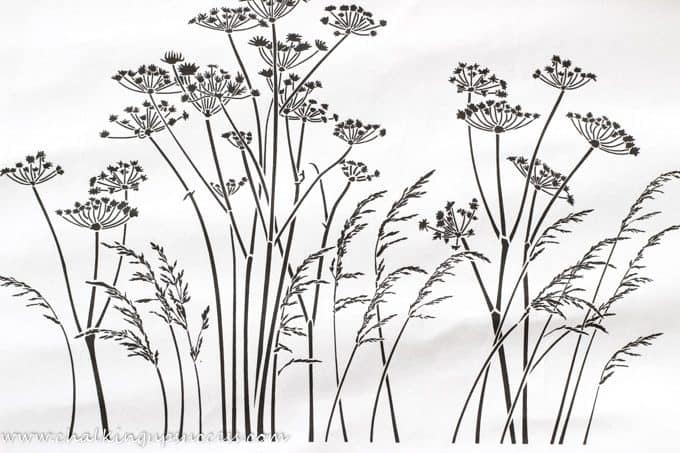 It’s a bit of a joke that my Allium seed heads make it into most of my Instagram pics. That said I really really love this style with grasses. I wanted to do something a little bit different on the side of this media stand and I found just the perfect stencil online. The shop is called Stencil Kingdom and they stock just about every kind of stencil you can imagine! This stencil is huge and I just used a small part of it on the side of the media stand. For the stencil, I used a little can of RUST-OLEUM Chalky Finish chalk paint in the colour Graphite. 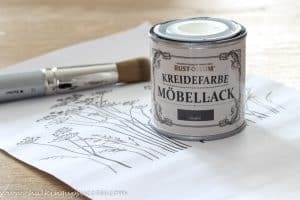 These small tins are ideal for stencilling or for using on any small projects really if you only need a small amount. 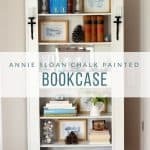 Just in case you were wondering, I don’t always use Annie Sloan chalk paint, it’s just that for a long time, that was the only chalk paint I could get where I live. Luckily chalk painting furniture has become more and more popular and now I can get various brands in my local DIY shop. 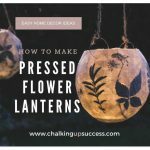 Just the excuse I need to start more chalk paint projects! I gave this chalk paint a good shake and a stir. I didn’t want to saturate my brush with paint because it could seep through underneath the stencil and ruin it. There was so much paint on the lid after shaking it that I just used that and I dabbed off the excess on a piece of paper towel. 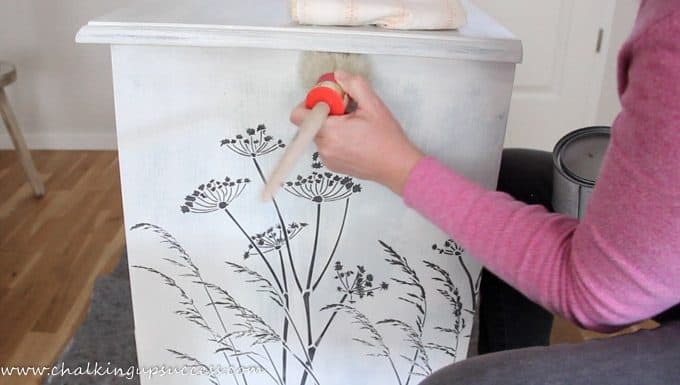 Once I started applying paint to the stencil, it was obvious that I needed to put a bit more chalk paint on my brush (Watch the video to see what I mean). Sometimes it’s hard to judge but that’s why it’s always best to start off with a small amount of paint. 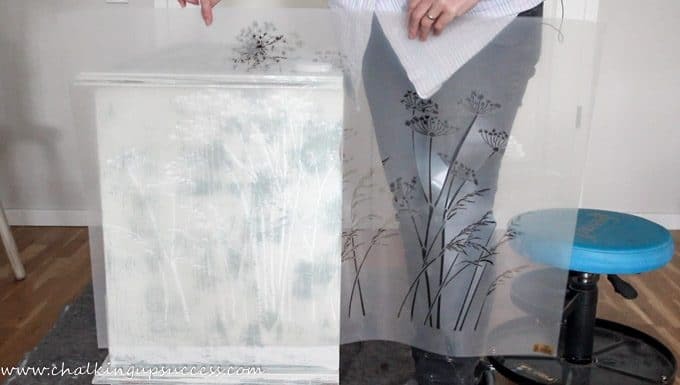 Once you start, you can see how thick the paint is and adjust the amount to suit the stencil. Once the stencil was completely finished and had had a chance to dry, I started waxing it right away. 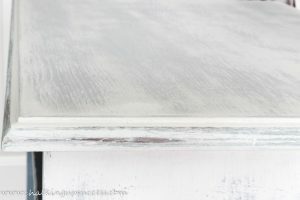 I’ve explained this process before on the blog and you can read more about my process for this in the post Easy Bookcase Makeover | Part Four, Wax. 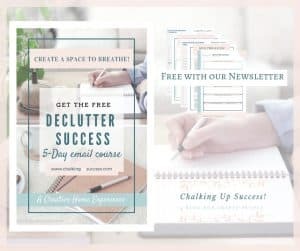 Otherwise, and I know I’ve mentioned this in my other posts and in my videos but you might not have seen them so I’ll say it again just in case: If you sign up to our newsletter, you get a free gift as a thank you. It’s called ’10 Easy steps to transforming your home with second-hand furniture’ and it’s packed full of information and tips to help you paint and finish furniture in one weekend or less. That is of course unless you have a frozen shoulder like me, then it might take you a little longer but you get the gist don’t you? After I gave this piece a full coat of Annie Sloan Clear Wax, I still wanted to tone down the distressing a bit and I used white wax for that. I explain this process in my bookcase makeover but basically, it makes the distressing a little more subtle. That’s it, the chalk paint media stand is finally finished and it’s perfect for the space. I can’t wait to start my next project and I already have something up my sleeve! What do you think of the finished piece? Do you like the stencil? 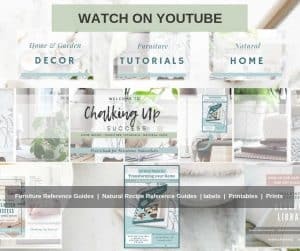 Have you tried any chalk paint products? If so, which ones have you used and what did you think of them? Your project turned out great!!! I do love that stencil and yay another great video. You are a natural!!! So glad to see you at the party, Jayne! Hope to see you again on Tuesday!